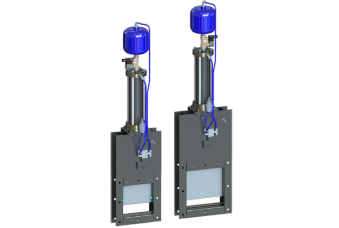 The Fast Acting Silo Inlet Valve may be used alone or in conjunction with a control system. The Euratex MultiZone Control Unit receives inputs from field devices such as emergency switches, spark detectors or pressure switches and issues the signal for the isolation valve to close. The unit also provides standby power in the event of mains power loss for up to 2 hours. The valve body and valve plate are 304 stainless steel as standard. The valve stem is stainless steel. The main actuator is machined in aluminium. The reservoir is epoxy coated carbon steel. All metal parts are machined, to provide high accuracy and fabrication within very close tolerances.